Wine enthusiasts will be eager to get their hands on our range of upmarket and useful wine sets. If presentation is important to you, the Napa Valley Wine Caddy is an ideal packaging option to complement any bottle of wine. 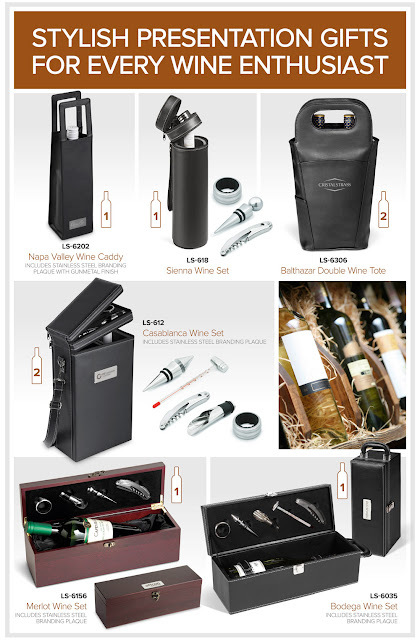 For options that include wine accessories like corkscrews, stoppers and leak-proof rings, we offer the Sienna, Casablanca, Merlot and Bodega Wine Sets. Complete your set by adding your logo to the stainless steel branding plaques that are included, as indicated on the image attached.